A strange thing may happen to our perception of time after a family member dies. The hours stretch and distend, with past breaking into present and present into future. This experience of time is central to Annabelle Moseley’s first full-length book of poetry, The Clock of the Long Now. Named for a 10,000 year clock that ticks only once a year, soon to be installed in the deserts of the Southwest, Moseley’s book vividly demonstrates how loss may transform time, balancing elegy and hope with equal care. That “long pause” is the “long now,” one presumes. Here and elsewhere, Moseley maintains a keen awareness of time through narratives shaped by its passage; yet she knows, too, that events and people decades apart often connect unexpectedly. Moseley’s careful sequencing defines her book’s inclusive vision: as one poem follows the next, we see how the past informs the present and influences the future. The book’s first half features poems that elegize and reflect on the death of Moseley’s father, a tragedy that results also in a very necessary exploration of family history. After his death, the poet discovers that her father was adopted, the son of a priest whom her grandmother excused from fatherhood when she relinquished their son for adoption (“How I Imagine He Proposed”); related poems on this powerful subject are “My Father Is Conceived,” “Cave,” and “The Accidental Is Born.” But whatever their connection with each other, most of Moseley’s poems remain independent entities, whether they span a century or a moment. This is true even in formal sequences, such as “Unearthing Jupiter: a Crown for a Slave” and in the impressive “Lloyd Manor Tesseract” that unfolds the home’s long history in sonnet-shaped glimpses. (Lloyd Manor is an historic eighteenth-century Long Island house whose past residents include Jupiter Hammon, the first published African American poet, enslaved on the original estate.) In Moseley’s sequence, people separated by time are connected by geography—a sort of “time travel,” Moseley calls it in her afterword—from celebrated author Anne Morrow Lindbergh and her famed aviator husband, to Jupiter Hammon, Moseley and her spouse, and even her priest-grandfather: “I entered Lloyd Manor, the time machine—/…It was a day for decades to break down.” Past and present moments become almost welded to one another, each informing the other and adding significance to the seemingly unrelated. Connections between past and future are further heightened in the handful of “mirror sonnets”: two-stanza poems in which the second stanza is, with slight modifications of punctuation or syntax, a line-by-line reversal of the first (Moseley herself devised the nonce form). Here, an echo of the familiar inhabits the new stanza, linking past and present moments within the act of reading; cause and effect are blurred, and the inherent circular movement questions the very idea of origin and ending—perfect for a poem such as “The Sea Cave of My Mother,” in which the speaker longs “to burrow down, and sleep/inside my mother’s womb, where I could hide/within my life-source, cradled in the deep.” In these mirror sonnets, distant events lie atop each other as on tracing paper, bringing surprising similarities to light. all three poets, our joys and pain—to sound. That’s how we travel time—our common ground. Moseley has cracked the sonnet form wide open. Her poems span past, present, and future, neatly contained in only a few lines. 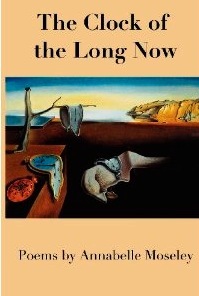 The Clock of the Long Now is an apt title, as her poems are surprising and attentive to time’s strange transformations. Dali would be proud.